Simon & Schuster Books for Young Readers, 9781534406469, 320pp. Stella Starflake Pearl knows, without a doubt, that she was born to be an adventurer. It’s too bad girls are forbidden from becoming explorers. But Stella’s father has never been one to play by the rules. Leaving behind her pet polar bear, Gruff, and beloved unicorn, Magic, Stella and Felix set off on an expedition to the snowy Icelands. There, Stella plans to prove herself as a junior explorer, worthy of membership in the Polar Bear Explorers’ Club. So when Stella and three other junior explorers are separated from the rest of their expedition, she has the perfect opportunity. Can they explore the frozen wilderness and live to tell the tale? 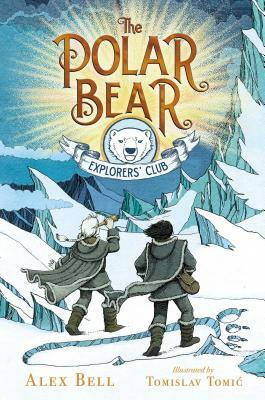 The first in Alex Bell’s imaginative new series, The Polar Bear Explorers’ Club is a fun and daring adventure filled with magic, outlaws, and fantastic faraway lands. Alex Bell has always wanted to be a writer but had several different back-up plans to ensure she didn’t end up in the poor house first. After training as a lawyer, she now works at the Citizens Advice Bureau, a legal advice firm in the UK. Most of her spare time consists of catering to the whims of her Siamese cat. Tomislav Tomic graduated from the Academy of Fine Arts in Zagreb, Croatia. He started publishing his illustrations during his college days, and since then has illustrated a great number of books, picture books, school books, and many covers for children’s books. He lives and works in Zaprešic, Croatia.